There’s no real news in the Social Security trustees report released this afternoon. We’re now a year closer to the date the trust fund will be exhausted, 2034 (same as last year’s projection), at which point current revenues will still be sufficient to cover 77 percent of benefits even if nothing is done to shore up the system’s finances. Each year, the release of the trustees report provides an occasion for Social Security scaremongering by those wanting to shrink our social insurance system. But not only can we afford current benefits, we can afford to expand them. The average retired worker beneficiary receives an annual benefit of $16,933. Disability and survivor benefits are even more modest. Social Security benefits are replacing a declining share of income at retirement, thanks to a rising normal retirement age and increased taxation of benefits—cuts passed in 1983 that are gradually taking effect (an increase in the retirement age is really just an across-the-board benefit cut that can be offset by retiring later). Rising Medicare premiums, which are deducted from Social Security, also reduce net benefits. Despite these trends, recent Census research has found that retirees are somewhat better off than previously thought, thanks to income from traditional defined benefit pensions that is underreported in household surveys. Nevertheless, Social Security remains by far the most important source of income for most seniors. 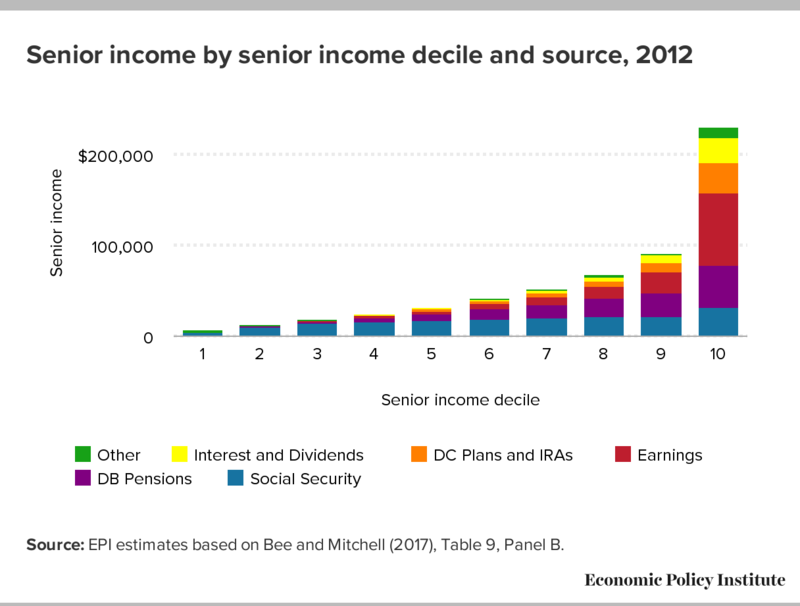 It constitutes most of the income of seniors in the bottom half of the income distribution and is the single biggest source of income for all but those in the ninth and tenth income deciles, for whom defined benefit pensions and earned income loom larger. Source: EPI estimates based on Bee and Mitchell (2017), Table 9, Panel B. The new Census research links demographic data from household surveys to tax and other administrative data and finds that seniors’ median household income is 30 percent higher than reported in the Current Population Survey because many seniors fail to report defined benefit pension income. While this is good news about today’s seniors, it bodes ill for seniors approaching retirement who have spent few or no years covered by traditional pensions and have little or nothing saved in retirement accounts. In 2016, the typical household headed by someone approaching retirement (aged 56-61) had only $21,000 saved in a retirement account—and 38 percent of these households had nothing at all saved in these accounts, based on analysis of the Federal Reserve Survey of Consumer Finances. Given that Social Security is the largest source of income for today’s seniors, and that its importance is only going to grow, today’s trustees report should serve as evidence that we should expand the program—not look for excuses to cut it. The barriers to expanding Social Security are ideological, not practical or even political in a traditional sense. Voters across the political spectrum strongly support raising Social Security taxes on all Americans, and even greater shares in both parties support increasing taxes on top earners, who currently don’t pay Social Security taxes on earnings above $128,400. A combination of eliminating this cap and a modest tax increase would not only shore things up, it would give us room to make the system more generous. But the Paul Ryan wing of the Republican Party and its wealthy backers haven’t abandoned their war on what they call “entitlements.” They’re entitled to their opinion, but the rest of us shouldn’t let a small minority dictate policy.